This diagram shows how transaction control protocol (TCP) operates to reliably send data through a packet network. This diagram shows that the TCP system receives the data from a specific communication port (port number). The TCP system then packetizes (divides) the sender's data into smaller packets of data (maximum 1500 bytes). Each of these packets starts with an IP header that contains the destination address of the packet. The TCP system then adds a second header (the TCP control header) that includes a sequence number along with other flow control information. The packets are sent through the system where they may be received at different time periods. The sequence numbers can be used to reorder the packets. The TCP protocol also includes a window size that indicates to the receiving device how many packets it can receive before it must acknowledge their receipt. This window defines how much data the sending device must keep in temporary memory to enable the retransmission of a packet in the event that a packet is lost in transmission. 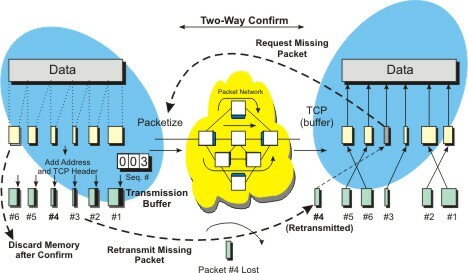 If a packet is lost, the receiving device requests the transmitting device to re-send the packet with a specific sequence number. This figure shows some of the key GPRS network elements that include a gateway GPRS support node (GGSN), a serving GPRS support node (SGSN) and a GPRS backbone network (the Internet in this example.) This example shows that the GPRS system adds dynamic time slot control to the standard GSM radio system. To provide packet data service, the GPRS system, the SGSN provides the processes of switching and access control that is similar to a mobile switching center (MSC) and a visitor location register (VLR). However, the SGSN provides for switching and access control (authorization and tracking) based on packets of data rather than continuous connections. The SGSN registers and maintains a list of active packet data radios in its network and coordinates the packet transfer between the mobile radios. 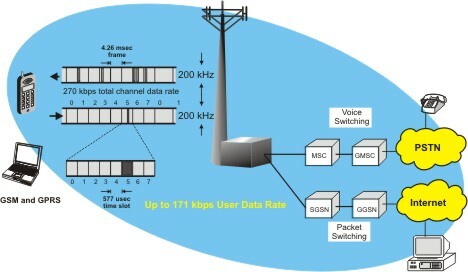 The GGSN is a packet switching system that is used to connect a GSM mobile communication network (GPRS Support Nodes) to other packet networks such as the Internet. This book explains the basics of circuit switched and packet data via a variety of wireless mobile systems. Included are descriptions of various public and private systems that are used for mobile data and messaging services. You will learn the different types of systems that can be used for mobile data ranging from simple cellular data connections to mobile telephones to dedicated packet radio communication systems and how the cost of these systems can range from less than a few pennies per gigabyte to over $10 per kilobyte. In addition to traditional mobile data systems, wireless system operators are converting their voice, dispatch, and paging systems to two-way mobile data systems. This has resulted in a much lower cost of sending mobile data, and it has increased consumer awareness of the availability and reliability of mobile data services. Because the needs of voice and data communication are different, the operation of the mobile data radio is different. The reliability, cost, and bandwidth limitations compared to wired communication systems can significantly vary. This book provides an understanding of what some of the key differences between mobile data systems and services. You will discover that the key types of mobile data devices include external radio modems, wireless PCMCIA cards, embedded radio modules, and mobile telephones. External radio modems allow the customer to simply plug in their mobile data device to their USB or Ethernet data port to their desktop or laptop computer. Wireless data PCMCIA cards can be added to most laptop computers or embedded radio modules allow devices such as PDAs and Laptops to integrate high-speed wireless data. Some mobile telephones include both voice and mobile data capability. Mobile data devices can have single mode (data only) or they may provide for dual mode (voice and data) capability. You will discover how the mobile data system can have dramatically different data transmission rates. In introduction to the different types of mobile data systems is covered including cellular data, DataTac�, Mobitex, CDPD, GPRS, EVDO, HSDPA and WLAN hot spots is provided. You will learn the basic operation and components, how these systems operate and the basic services that they can provide.